Where could you turn to if you wish to invest in the most tax efficient way and for one reason or another are unable to make an increased payment into your pension, or ISA? When it comes to tax efficiency, these tend to be the more common investment vehicles. However, another world exists, that does not involve being smart with the tax rules and taking risks with HMRC. There are legitimate investments with valuable tax benefits, that sit between normal pension/ISAs investments, and the more aggressive tax planning schemes that have been detailed in the press over the past few years, due to people like Jimmy taking the wrong advice from the wrong people. These HMRC approved investment vehicles contain some very useful tax reliefs and benefits for the right investors, but do not come without any risk. It is an area which most investors are still not fully aware of. The subject of risk is uncomfortable to many and tax planning vehicles are often mistaken for tax avoidance schemes. In fact, as far as legislation and the law is concerned, tax avoidance is legal, it is tax evasion which is illegal, although the lines have been blurred in recent years. There are a number of legitimate investment tax wrappers that whilst tend to have a higher investment risk, offer a number of tax benefits, these include Venture Capital Trusts (VCT’s), Enterprise Investment Schemes (EIS’s) and Business Property Relief (BPR) investment schemes. The value of investment can go down as well as up and you may not get back as much as you put in. In the article, I will just focus on VCT’s. They are in effect an investment company open to individual investors. They are listed on the London Stock Exchange and have their own board of directors. 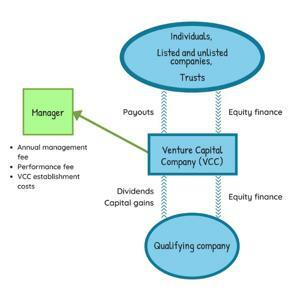 Their purpose is to create a portfolio of small quoted companies, which require capital to grow and is supported by investment proceeds of many investors coming together through an open VCT. The government launched this style of investment in 1995 to find a way of encouraging individual investors to fund smaller growth companies through a tax efficient wrapper, that provides various tax reliefs. The key one is the 30 per cent income tax relief, available for investments up to £200,000 per tax year, so long as you have sufficient income tax liability of the same amount, which can include earned, rental, investment and interest income. With a VCT, you are buying shares within the VCT company who will look to provide dividends and increase the underlying value of the shares. The dividends do not incur tax and much like an ISA, do not need to be declared on your tax return. On maturity / encashment after five years, any gains generated do not incur capital gains tax (CGT). However, once the money is in your estate, it will form part of inheritance tax (IHT) calculation in the event of death. It is common for investors to continue to reinvest the sale proceeds into another VCT and obtain a further 30% tax relief. f) The level of capital guarantees and qualifying conditions can vary between products and providers. Capital protection (and/or income payments) rely on the financial strength of the provider (and/or any counterparties) and their ability to fulfil their commitments. The failure of any relevant counterparty may result in loss of some or all the original capital and/or income. Future blogs will explain the benefits of EIS’s and BPR schemes. In the meantime, if you require any specific advice, please get in touch and we will ensure a qualified adviser makes contact with you.